Author contributions: Borg AN and Al-Najjar Y were involved in direct patient care; Chahal AA and Borg AN wrote the manuscript, including preparation of figures; Kim MY and Al-Najjar Y edited and referenced the manuscript; Kim MY acted as the corresponding author for publication process. 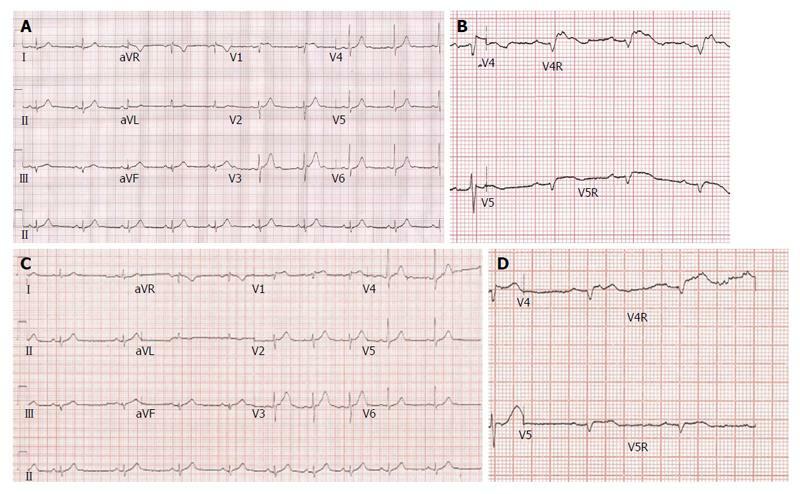 We report an unusual case of an isolated right ventricular infarction with haemodynamic compromise caused by spontaneous isolated proximal occlusion of the right ventricular branch of the right coronary artery (RCA), successfully treated by balloon angioplasty. A 58-year-old gentleman presented with epigastric pain radiating into both arms. Electrocardiograph with right ventricular leads confirmed ST elevation in V4R and a diagnosis of isolated right ventricular infarction was made. Urgent primary percutaneous intervention was performed which revealed occlusion of the right ventricular branch of the RCA. During the procedure, the patient’s blood pressure dropped to 80/40 mmHg, and echocardiography showed impaired right ventricular systolic function. Despite aggressive fluid resuscitation, the patient remained hypotensive, continued to have chest pain and persistent electrocardiograph changes, and hence balloon angioplasty was performed on the proximal right ventricular branch which restored flow to the vessel and revealed a severe ostial stenosis. This was treated with further balloon angioplasty which restored TIMI 3 flow with resolution of patient’s symptoms. Repeat echocardiography showed complete resolution of the ST-elevation in leads V4R and V5R and partial resolution in V1. Subsequent dobutamine-stress echocardiography at 4 wk showed good left and right ventricular contractions. The patient was discharged after a 3-d in-patient stay without any complications. Core tip: We describe an unusual case of an isolated right ventricular infarction caused by spontaneous proximal occlusion in the right ventricular branch of the right coronary artery (RCA), successfully treated by balloon angioplasty. Isolated right ventricular infarction (IRVI) is a rare presentation of occlusion of the right ventricular branch of the RCA. Most incidences of IRVI in the literature have been reported as complications to percutaneous intervention to the RCA. Isolated right ventricular infarction (IRVI) is a rare presentation of occlusion of the right ventricular (RV) branch of the right coronary artery (RCA). Most incidences of IRVI in the literature have been reported as complications to percutaneous intervention to the RCA. There have been only two other reports describing spontaneous RV branch occlusion leading to IRVI. We describe an unusual case of IRVI caused by a spontaneous proximal occlusion in the RV branch of the RCA, successfully treated by balloon angioplasty. A 58-year-old gentleman with no significant past medical history presented to the emergency department with sudden onset epigastric pain radiating to both arms. Initial electrocardiography (ECG) showed 3 mV ST elevation in lead V1 (Figure 1A). A subsequent ECG with right ventricular leads V4R and V5R confirmed ST elevation (Figure 1B) and a diagnosis of IRVI was made. Chest X-ray and clinical examination were unremarkable. The patient was given aspirin 300 mg, ticagrelor 180 mg, atorvastatin 80 mg and was transferred to our hospital for an urgent primary percutaneous intervention (PCI). The right radial artery was accessed using a 6F sheath (Glidesheath, Terumo) and angiography performed using a 5F Judkins left 3.5 diagnostic catheter and a Judkins right 4 guide catheter. The left main stem was free of significant atheroma. The left anterior descending artery had a 30% focal atherosclerotic plaque in the proximal vessel with a further mild mid-vessel stenosis. The circumflex artery and obtuse marginal branches did not have any significant atheromatous changes. The RCA was noted to be dominant and of moderate calibre. There was 40%-50% stenosis of the mid RCA and a moderate-severe ostial stenosis of the posterior descending artery (PDA) with TIMI 3 flow through the main vessel. Careful scrutiny of the images showed absence of the RV branch of the RCA (Figure 2A). At this point, the patient’s blood pressure had dropped to 80/40 mmHg. Despite aggressive fluid resuscitation, there was little improvement in the BP and the patient had ongoing symptoms of chest pain with persistent ECG changes. Therefore, with Bivalirudin cover, the RV branch lesion was crossed with a hydrophilic Runthrough wire (Terumo) with an additional balance middle weight (Abbott Vascular) “buddy” wire to the distal RCA (Figure 3). This was followed by balloon angioplasty of the proximal RV branch with a 1.2 mm × 10 mm MINI TREK (Abbott Vascular) compliant balloon (Figure 4), which restored flow to the vessel and revealed a severe ostial stenosis. This was treated with further balloon angioplasty using a 2 mm × 6 mm non-compliant Quantum Apex (Boston Scientific) balloon. The final angiographic result showed restoration of TIMI 3 flow (Figure 2B) with resolution of chest pain. A bolus of Bivalirudin (a direct thrombin inhibitor) was administered, followed by an infusion. Figure 1 Electrocardiography. A: Standard 12-lead ECG at time of presentation showing ST elevation in lead V1; B: Right-sided ECG leads showing ST elevation in V4R and V5R; C: 12-lead ECG post-primary percutaneous intervention showing partial resolution of ST elevation in V1; D: Right-sided ECG post- percutaneous intervention showing resolution of ST elevation in V4R and V5R. ECG: Electrocardiography. 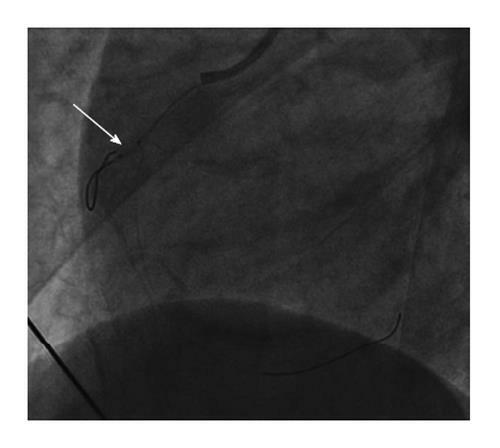 Figure 2 Balloon angioplasty for right coronary. A: Cranial view of right coronary artery showing occluded right ventricular branch (white arrow); B: Restoration of TIMI 3 flow in right ventricular branch after balloon angioplasty. Figure 3 Right anterior oblique view of balance middle weight wire crossing the proximal lesion in the right ventricular branch. There is a “buddy” wire in the main right coronary artery vessel. Figure 4 Same view as Figure 3 (right anterior oblique), showing balloon inflation in proximal right ventricular branch (white arrow). The patient received routine post-MI care on the coronary care unit. The peak 12-h Troponin-I was 16628 ng/L from the initial 1115 ng/L (normal 0-59 ng) and creatine kinase was 632 IU/L (normal 25-175 IU/L). A transthoracic echocardiogram showed a normal sized left ventricle (LV) with preserved systolic function, but the RV had reduced radial systolic contraction of the basal and mid-segments of the free wall. The patient was discharged after an uncomplicated 3 d in-patient stay. Pre-discharge 12-lead ECG (Figure 1C) showed partial resolution of the ST segment elevation in lead V1 and complete resolution of ST-elevation in V4R and V5R (Figure 1D). After 4 wk, the patient was followed up with a high dose dobutamine stress echocardiography with intravenous ultrasonic contrast (SonoVue, Bracco). It showed good contractile reserve in the RV free wall and all LV segments. On this basis, we elected not to treat the residual PDA disease. Significant RV infarction usually occurs with occlusion of the RCA, when it is accompanied by concomitant infarction of the LV segments supplied by the RCA. Smaller RV infarcts can occur with occlusion of the left circumflex and left anterior descending arteries. Involvement of the RV myocardium is common in infarction of the left ventricle. Conversely, IRVI is rare, accounting for less than 3% of all infarctions. In patients with inferior MI, the presence of RV infarction is associated with a higher risk of arrhythmias and cardiogenic shock and death. Interestingly IRVI appears to have a relatively good long term prognosis, although immediate complications resulting in sudden death have been reported. RV function tends to recover over the months following the acute event. This benign clinical course is most likely due to the thin muscular wall of this ventricle which provides a more favourable supply/demand ratio and the ample collateral supply from LV territory. Isolated RV infarction has previously been attributed to occlusion of a non-dominant RCA or occlusion of an acute marginal artery, spontaneously or after PCI. IRVI in the absence of the dominant current of injury from the LV posterior wall can present as ST elevation in the precordial leads V1-V3, similarly to an anterior MI. Obtaining right sided ECG may help to make this important distinction. ST elevation and Q waves in V4R is highly specific for IRVI. The ST elevation in the left precordial leads up to V5 are “dome-shaped”[3-5]. Echocardiographic features such as RV free wall hypokinesia, dilated RV chamber, leftward septal deviation provide a valuable non-invasive diagnostic aid in acute RV infarction. Cardiac magnetic resonance provides a more accurate assessment of RV size, ejection fraction and regional wall motion abnormalities. The MR pulse sequences applied to the LV can also be used to assess the area at risk and extent of infarction by T2 weighted oedema imaging and T1 weighted gradient echo late gadolinium enhancement images, respectively. We believe PCI is a good option for IRVI when there is haemodynamic compromise. Management should also include strict haemodynamic monitoring, avoidance of vasodilators and diuretics, inotropic support and treatment of arrhythmias. A 58-year-old male presented with sudden onset epigastric pain radiating into both arms with no significant past medical history. Troponin I on admission was 1115 ng/L (normal 0-59 ng) and the peak 12-h Troponin I was 16628 ng/L. Electrocardiography showed ST-elevation in lead V1 and with right ventricular leads, ST-elevation was seen in V4R and V5R leading to the diagnosis of isolated right ventricular infarction. Echocardiography showed impaired right ventricular (RV) systolic function. 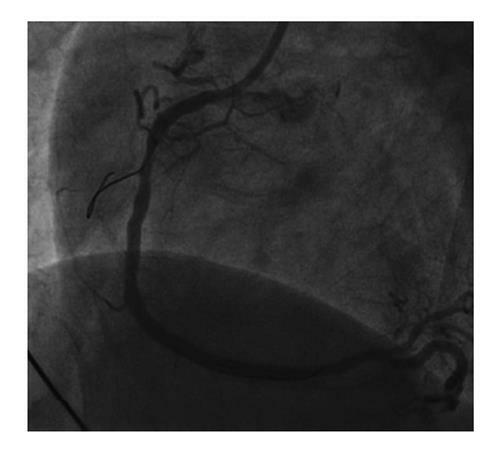 Coronary angiography showed occlusion of the right ventricular branch of the right coronary artery (RCA) (TIMI 0). The patient was given aspirin 300 mg, ticagrelor 180 mg, atorvastatin 80 mg before transfer for urgent primary percutaneous intervention. Balloon angioplasty was performed at the proximal occlusion in the right ventricular branch of the RCA. Bivalirudin give peri-procedure. Reported cases comment on RV branch involvement with the main RCA and isolated occlusion usually as a complication of percutaneous intervention to the RCA. Anecdotal evidence and received wisdom favour a conservative approach, with the belief this small vessel can be sacrificed without little harm. However, each case demands a nuanced approach with an individualized risk-benefit analysis. An isolated branch occlusion can occur and can have dire consequences without prompt intervention. This is a rare case report that teaches the authors’ to be “exsisto semper vigilans-to be ever vigilant”. It is an infrequent case in their daily clinical practice that may be easily missed leading to a delay in diagnosis and management, which may lead to fatal consequences. This is a well written case report that offers useful clinical information.